For reasons too long and complex to explain I was out mowing some lawn near the edge of a nice hardwood wood lot on one of our several farms when I discovered that I had just mowed a five foot wide swath right through the middle of a whole bunch of carex, carexes, or whatever. Twixwood is now in the carex business. We propagate some half a million plugs of some twenty different varieties a year and so I got all excited because I cannot tell one carex from another and being an optimist I think that they are all worth money. We took some photos and sent them off excitedly only to find out that I had discovered Common Woodland Sedge. Needless to say, anything with the word ‘common’ in it is not valuable. We can get lots of it and it grows right out into the grass, so it is tough. I am not sure why people want carexes. With the kinds of plants that we grow here in the groundcover business we are careful to not inquire too closely as to why anyone would want anything. We just want to know if they will pay for the plants that they get from us. Their morality, sense of ethics, or even good taste, is not our concern. We, after all, do not profess to be landscapers or designers or people who suffer from good taste. Disillusioned as I am with common wood sedge, I will now discuss what we have in large quantities right now out in our fields. Carex bromoides is out there in quantity. Common name ‘Brome Hummock Sedge’ and it forms dense tussocks or hummocks or clumps things. Midwest Groundcovers has a nice photo and description on their website. They say it is one foot high and two feet wide. Other people say that it gets to be two feet high. I suggest looking it up on the Midwest website—they put a lot of effort into getting good information—and then buying it from us. Another carex that we have far too much of out in the field is Carex caryophyllea ‘Beatlemania’ or Mop-headed Sedge. This has a distinctive drooping habit. I have not found out if this is a selection or a hybrid or whatever. 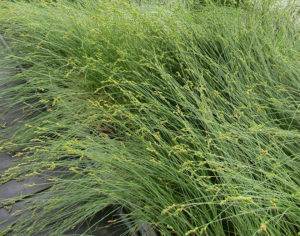 We have lots of it, there is almost no demand for it, and to us all carexes look kind of alike. We will let you know as soon as we figure out how to tell a pretty sedge from an ugly sedge. 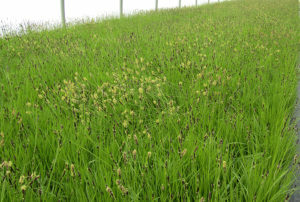 We think that this latest flurry of interest in carex comes from Roy Diblik, most recently of Northwind Perennial Farm out of Burlington, Wisconsin. Roy gives talks with lots of photos and by the time he is done most people are both enthused and confused; an ideal combination for a potential customer base. Roy has told me that if he has anything to do with it he is going to replace all pachysandra with carex. Even though we stick more than four million pachysandra cuttings a year and have the capacity to do more, we are a non-ideological, ecumenical even, people over here in rural Michigan. We are in the plant growing business. All that we know is that pachysandra grows (roots, propagates) in the summer and carex divides and roots in the winter. Whenever in the future pachysandra runs its course we will be ready with fields full of carex. 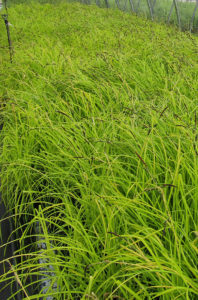 If anyone has a preference for one sedge or the other please get us some true-to-name stock plants along with the true name and we will get started. They all look alike to me, or did I say that already? If anyone wants to see what carexes look like in a garden setting I recommend a visit to Olbrich Gardens up in Madison, Wisconsin. There are different patches of them scattered about here and there in the shade for the cognoscenti to admire. The rest of the place is interesting in and of itself. Just up the road a short ways are some coffee shops with college graduate students in social studies lounging about and near the shops are student inhabited housing with small yards ideologically correctly planted in perennials or native plants or sometimes just plain over-grown grass. None of this burning gasoline polluting the world with fumes, carbon dioxide, and noise for these people. Our small towns here in Michigan have yet to achieve that level of sophistication. Anyone who had front yards like these found in Wisconsin would be fined and thrown in jail while the authorities ran brush choppers promiscuously through the front yards. This blog started out describing what I was feeling deep down inside when I discovered a nice patch of carex on my property. After that the blog disintegrated into a sales pitch for Twixwood product. In the future we will attempt to get back to the pure essence of the blog. I will try to listen to my deep down insides more. 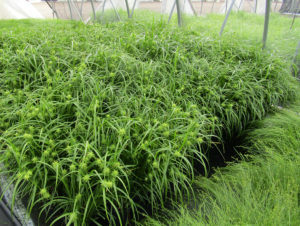 But, as long as this blog has been so badly bungled I will end by mentioning that we have several hundred thousand Deep 50 plugs of Carex pensylvanica that we made a few months ago and grew under poly and a little heat. They are thick, well-rooted, and stretched way too tall. They are for sale.